One of ways to improve your odds in the on-going technical recruitment struggle is to sponsor a developer-focused Meetup group. And as the organizer of a Meetup group that attracts a ton o’ developers (and is in need of sponsors every month), I couldn’t agree more… mostly because I’m extremely biased. But I digress. As Charlie said, well-run meetups with devs equals relatively cheap PR for companies and puts them in the thick of the community. At SF Nightowls, for instance, we’re always looking for sponsors to help us put on our popular late night coworking sessions. (Past sponsors include HP, Zappos IP Inc., Yahoo Developer Network, Codelesson, and many others.) In return for their beer-buying patronage, we give them a chance to talk to the group, hand out schwag, get lot of attention on the site and in reminder emails, etc. It’s a complete win-win: We get to keep our Meetup group free and open for all to attend, and sponsors get direct access to smart, savvy potential recruits. 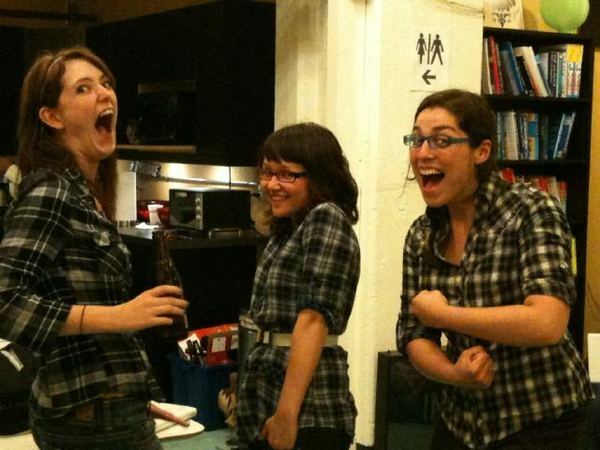 Like these girls, who had never met before but showed up to Nightowls wearing the same thing. Great minds think alike. Another savvy meetup strategy is simply to start your own group. I’ve been to many, many Meetups/events, and I’ve partnered with a few Meetup groups (big shout out to JS Hackers) and helped put on some hack days. Having sponsors makes an organizer’s life infinitely easier, and we’re always over-the-moon happy to give you promotion and recruitment leads in return. Note: Not by spamming our members, but through actual introductions at the event (“Hey, Mr. Sponsor, please meet this very talented dev I know who happens to be looking for a new job”). We’ve seen a lot of connections made through our events and others’. Remember: Being a part of the community makes it easier for your company to find the talent you seek. Remaining on the outskirts makes it easier for your competitors to swoop in and out-hire you.